This software is not supported by nor affiliated with Electronic Arts. Use at your own risk. This software violates EA's Rules of Conduct, specifically: "Modify any part of the EA Service that EA does not specifically authorize you to modify." Discussion of this application or linking to this page is not allowed on Electronic Arts websites. Doing so may result in account suspension or cancelation. There's lots of complaints across the interwebs about the inability to update The Sims 3, expansion packs, and stuff packs. It was tedious to hunt down numerous links everytime there was an update so I decided to throw this little time-saving gem together. -Your system registry must be accurate in regards to The Sims 3. 1) Download the program and extract the zip attached to this post (TS3PD.exe and TS3Lib.dll must be in the same directory). 2) Run TS3PD.exe (it may take a while to start because it is collecting update information from the web, from your registry, and from the game directories). 3) Select a save directory by clicking on the "..." button or enter the path into the empty box. This is where your downloaded files will be placed. 4) If files appear in the lower list view, that means there are updates available for your game. If you want to automatically install the updates, check "Automatic Install" now. 5) Click on "Download All (sequential)" and it will download them in order. If you have "Automatic Install" checked, it will also install them. If you did not, manually install them in the same order it gave them to you. 7) Once all of the download status says "Installed" or "Downloaded," it is safe to close the application. Offline Usage Instructions Offline is no longer supported as of version 3.0. -"Your The Sims 3 Base game is incompatible with the current sims 3 expansion pack. Please update your game via the game launcher." -"There was an error during startup. See the Log for more details." 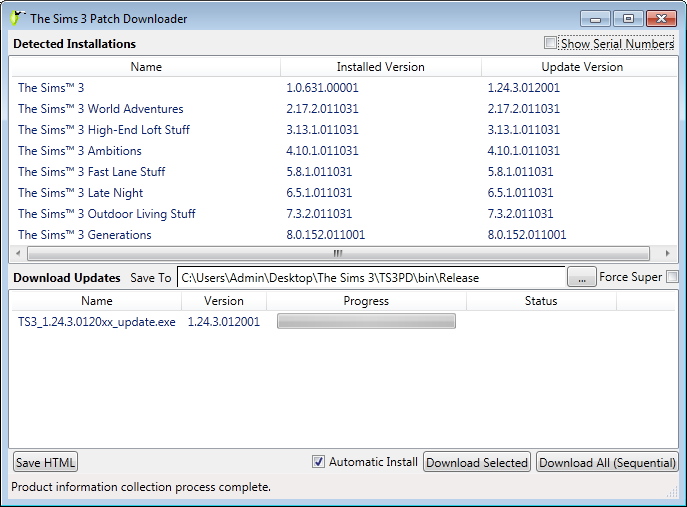 ts3pd.zip | Description: 1.69.43 - Minor update to stop skuversion.txt nag. 3. Install the Microsoft .NET Framework 4.0 Client Profile if you don't have it already. Make sure to review the Disclaimer & Warning portion of the Overview page, if you have not done so already. To remove, simply delete the application. It does not store anything on your computer (except downloaded patches).